We strongly believe that something must be done to mitigate the effects of climate change and manage the risks we all face from the resulting high-highs and low-lows we have seen in recent years in the water levels of Lake Michigan-Huron and Georgian Bay. While a coordinated effort on the national and international levels is required to tackle the greater effects of climate change and alter the uncertain climate and extreme weather patterns associated with it, we believe there is something that can be done to better manage fluctuating water levels and address our currently unpredictable water future. To this end, the issue of extreme water level fluctuations is one of the areas where GBF invests time and resources. The Mowat Study clearly showed that volatility in water levels is not only an environmental issue, but also a personal and economic issue. A healthy ecosystem supports public health and safety, as well as a vibrant and prosperous economy, and vice versa. They are all inter-connected. The prudent response strategy is to take a long-term view of the risks and vulnerabilities involved, apply leadership and visionary thinking in determining how we can best mitigate them, and to do it now, while there is still time. We believe a sustainable solution can and must be found to this challenging ongoing problem, one that will finally put an end to the uncertainty and concern surrounding our waters. In order to address this important issue, GBF conducted a comprehensive professional engineering feasibility study that began in 2015 to explore a broad range of possible climate-resilient options and provide a thoughtful and informed analysis of them. Our goal: identify and assess a variety of engineered structural solutions and determine the most effective and suitable climate resilient configurations to mitigate plausible future extreme water levels of Lake Michigan-Huron and Georgian Bay. 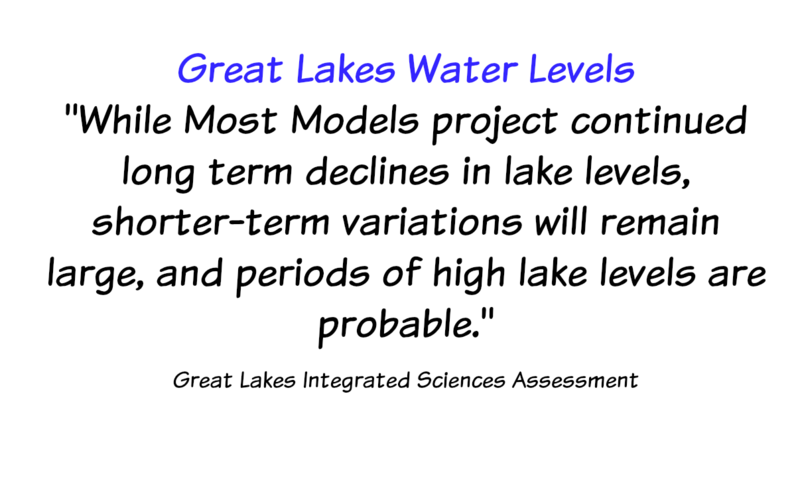 Update October 2016, Managing Water Levels in the Great lakes: The Search for New Solutions : Please read AECOM's executive summary of the finished report titled Providing Structural Solutions for Adaptive Management in the Great Lakes: Creating Climate Resilience. We also believe that the time to make these kinds of infrastructure changes is now, years before disaster strikes and worst case scenarios become grim reality -- and enormously expensive to recover from. Averting the problem will be much more cost-effective than trying to repair extensive damage once it has occurred. Prevention is key. The time to act is now. New York City learned this lesson the hard way recently when it decided not to install storm surge controls off its shores right before Hurricane Sandy hit and caused more than $23 billion in ocean surge flooding and related storm damage. At the time, the proposed visionary storm barriers were declined because popular belief was that storms of the century like Sandy would be very infrequent. But the reality is that such increasingly severe storms are happening more frequently worldwide as a consequence of climate change and extreme weather. We are seeking a long-term flow-attenuating engineered structural solution for our waters that will be flexible, viable and navigable for the next 50 to 100 years. We believe it must also be innovative, climate resilient and responsive over a range of climate scenarios. Further, it must be ecosystem friendly, with minimal impact on biodiversity and habitat, and involve very little in-water blasting or dredging during construction. As well, it must reflect integrated, systems thinking that takes into consideration the entire Great Lakes St. Lawrence water system, so that any solution we identify is mindful of both upstream and downstream needs and interests. We have already issued a Request For Proposals and have selected the best international engineering consulting firm for the job - AECOM. We have asked the firm to review and build upon prior flow regulation assessment work done by organizations such as the IJC over the past 100 years, and to explore various state-of-the-art and emerging materials and technologies arising in the 40 years since the last engineering design work was done. The scope of work will be to identify the most viable solutions, possible locations, and how we can make best use of modern water management controls and materials. This is essential because none of the prior thinking or work looking at possible structural interventions considered any contemporary or climate resilient technologies. When engineers last deliberated about this issue concerning the Great Lakes it was 1977, before many of today’s innovative materials, controls and processes had even been invented, and that work was only done with respect to controlling Lake Superior. Engineering and materials science has progressed a great deal since then, and we would like our study to take advantage of the many breakthroughs made in the interim. We anticipate potential solutions to be reviewed will go beyond previously contemplated compensatory structures such as sills and weirs, power generating structures such as in-stream turbines and hydro-electric plants, and adaptive management structures such as movable and inflatable weirs, lifting or tilting gates, flap gates, ice booms, etc. The final report – expected in 2016 - will include a plausible engineering design and costing, and the results will be shared with key stakeholders. 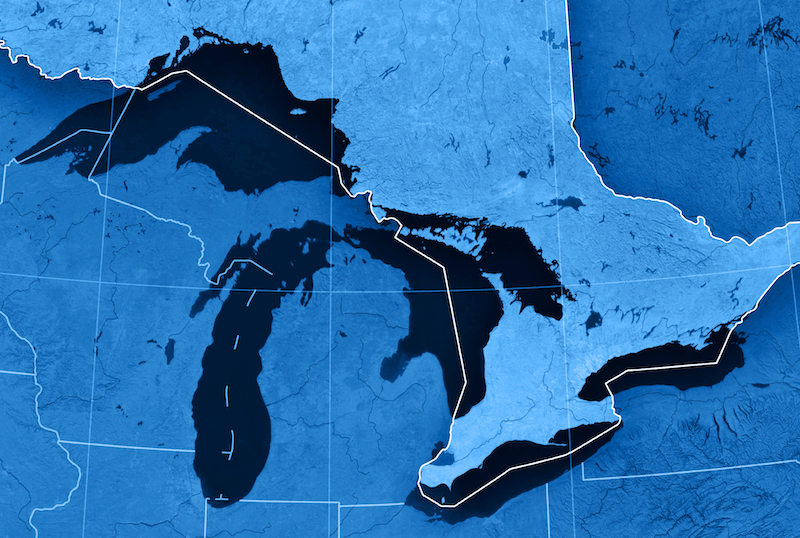 These will include the US Army Corps of Engineers, bi-national organizations such as the IJC and Seaway authorities, all State and Provincial governments in the Great Lakes Region, the U.S. and Canadian federal governments, Great Lakes industries, and port authorities, among others.